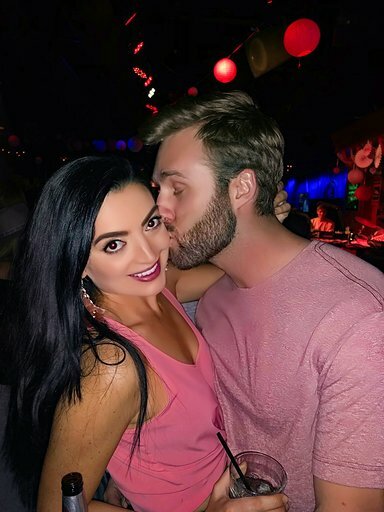 Howl At The Moon, Pink Pianos Party — Denv.Her. Boy oh boy were we singing some tunes this past Friday babes! The best piano bar in Denvy invited denv.her. and friends out for a night of charity & fun and we had the most amazing time. October is Breast Cancer Awareness month #BCAM and Howl At The Moon is NOT letting this disease pass quietly by. This past Friday was Howl At The Moon's second annual Pink Pianos Party benefiting Open Arms. Open Arms is a non-profit organization that supports breast cancer patients and families. 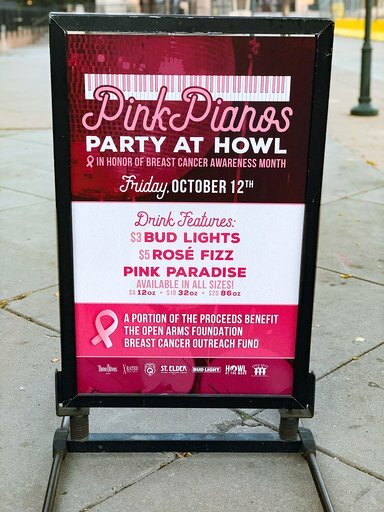 Howl At The Moon is committed to help those battling breast cancer and the Pink Pianos event honors one of Howl At The Moon's own who was taken too soon. Howl At the Moon's, Betsy Sweeney, passed away in 2016 from Breast Cancer. Betsy was a fighter during her battle & was ferociously dedicated to helping other women impacted by this ugly disease. Betsy's legacy is the creation of the patient navigation oncology program at the Amita Health Cancer Institute & Outpatient Center & Howl At The Moon honors her memory with the annual Pink Pianos Party. Howl At The Moon has a specialty bucket on their menu - The Pink Paradise - that you can purchase year round and a portion of the sales from this bucket goes to the Open Arms Foundation. The Pink Paradise not only supports an amazing cause but it is delish and can be shared amongst yourself and a large group of friends #drinkupbuttercup. denv.her. and crew got DOWN on some of these bad boys. The Pink Pianos Party boasted a beautiful set up with a full taco bar, desserts (THESE DONUTS YOU GUYS - may or may not have had 5 - & let's be real I totally did lol), and raffled giveaways. The raffle prizes were AMAZE at this event you guys! & SO many people in our group walked away with stellar gifts! These included Kendra Scott earrings, a Kendra Scott Bracelet, Lash extension appointments, spray tans, a free nights stay at Le Meridian, a dinner at Blue Agave, and Comedy works tickets, and a fully autographed hockey stick by the Colorado Avalanche hockey team! #winning! After the giveaways - it was time to party and boy oh boy we did just that. #ESPECIALLY when the musicians blessed us with Whitney Houston's - I Wanna Dance With Somebody lol. Scream singing in FULL effect. denv.her & friends, decked out in pink, got down on the dance floor and continued jamming to the live tunes which included some of our favorites - Sweet Caroline, Don't Stop Believin, Shake It Off, and Livin' On A Prayer. Thank you so much to Howl At The Moon and the beautiful Sam Parker for hosting denv.her. for the Pink Piano's party! We're obsessed with this piano bar to begin with and add the cherry on top of them pushing for such a phenomenal charitable cause and they have our hearts. Hope to see all your beautiful faces at Howl soon!